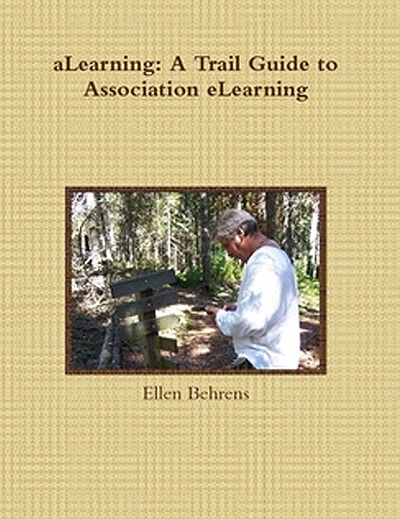 After contacting Brandon-Hall, Bersin & Associates, and other organizations to find out if they have conducted research on the frequency of online learning in the world of associations and discovering they have not, I decided to try to collect a bit of information myself. If you’re curious about whether other associations include online learning in their educational offerings, you’re welcome to participate and receive the survey results for free. It’s a brief survey to gather basic information that will be provided in aggregate to all participants who wish to receive the results. If there are questions you’d like to ask your colleagues, post them here or send them to me via private e-mail so they can be included in a future survey. Your participation in the survey will help you see where your efforts compare to others in our profession. I’m sure I’m not the only one who says Thank YOU! for your willingness to contribute information about your association. It’s a small start, but not an insignificant one. Welcome to the aLearning Blog! Our focus here is on elearning for associations — particularly trade associations. If you snoop around the Web as much as I do, you haven’t found very many sites, blogs, forums, or other resources specializing in this area. If you have, send them along and we’ll post them. Most organizations are devoted to corporate e-learning and to companies (or internal departments) that develop e-learning. Maybe that’s because online learning has come to associations more gradually than to corporations, higher education, and the military. Large associations who serve members who have to keep professional certifications current have gotten onboard. Online courses offer the perfect solution to the challenge of getting the requirements completed on time in the midst of complicated professional and personal lives. Online learning, we all know, can eliminate the need for travel, which means learners can study at home or at the office, preserving a greater semblance of work-life balance.